Sony’s XBR-55X930D, one of the company’s latest 4K UHD TVs, demonstrates that you don’t necessarily need quantum dots or organic LEDs to push color and brightness beyond the LCD norm. The X930D’s picture is a bit subdued compared to what you get with those other technologies, but it’s far beyond entry-level and most mid-range sets in virtually every metric: color, contrast, black levels, and brightness. The 55-inch class (54.6-inch) XBR-55X930D is street-priced at $1500, while the 65-inch (64.5-inch) model costs $1999 and the 75-inch (74.5) model $3999. That might sound like a lot of green, but it’s only half what you’d spend for an OLED or quantum dot TV with similar specs; and as I said, the XBR-55X930D’s picture far outstrips that of cheaper TVs. The XBR-55X930D weighs about 49 pounds, with the stand adding another 6 pounds. That’s a bit on the hefty side for a 55-inch TV, so you’ll most likely need a partner to set it up. It’s doable if you have the wingspan and the muscle, but why chance it? The XBR-55X930D is VESA-mount compatible and extremely thin—only about an inch and a half at its thickest point. With the right mount, there’s minimal protrusion from the wall. The display panel is a 3840 x 2160-pixel (4K UHD) LCD with a 120Hz refresh rate. It’s billed as HDR, and the HDR content we played on it—as well as the 516 nits on a white screen without HDR enabled—back that claim up. But it is HDR-10 only. As with all Sony, Samsung, and most other HDR TVs, there is no support for Dolby Vision with its dynamic metadata (you can read about that here). Note that you may need to manually enable 10-bit color (selected “enhanced”) in the external port settings, though HDR handshaking, at least with most Ultra HD Blu-ray players, should take care of that on its own. Even from this angle you can see that the X930D is thin. The XBR-55X930D provides top-notch connectivity: There are two USB 2.0 ports for peripherals; one USB 3.0 port for storage; four 60Hz HDMI 2.0a ports (with HDCP 2.2), one of which supports an audio return channel (ARC) for output to audio equipment; plus a hybrid composite/component in. There’s also a coax port, as well as analog and digital TV tuners are on board. Audio connections include optical S/PDIF digital audio out, stereo RCA analog audio out, and a 3.5mm headphone/subwoofer out. A 2.5mm RS-232C port for control via a set-top box is also included. Wireless connectivity is supported via both 802.11AC and Bluetooth 4.1. Wi-Fi Direct and Miracast are also supported. 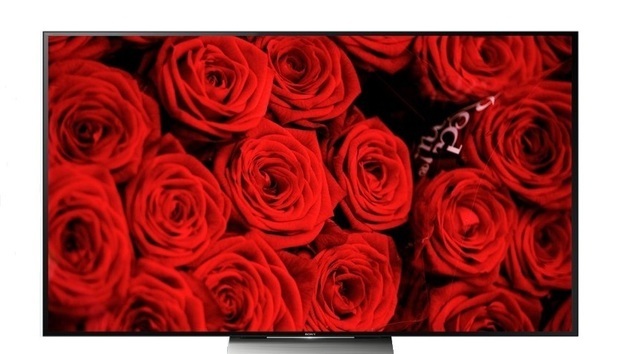 This TV is 3D-capable, too; technology-wise, the XBR-55X930D is more than up to snuff. If the X930D series has a weak point, it’s interfacing with the user. The on-screen GUI looks okay, and it’s Android, so there are a ton of apps; but the organization and layout aren’t particularly intuitive. At least this iteration hasn’t crashed on us, but the video file player is appallingly slow to iterate files, and it seems to misplace files you just played. The interface is sometimes slow to react, which makes you overshoot your intended item, the Action Menu only works when you’re playing media, settings that belong in the action menu are buried elsewhere…. I could go on. Android offers a lot of apps, but overall the X930D’s interface experience is a bit clunky. We weren’t in love with the remote either. Compared to the simple elegance of Samsung’s and LG’s high-end efforts, this one is too large and old-school busy. The circle of cursor and select buttons are surrounded by another circle of buttons that are too easy to hit by mistake. As nothing is backlit, this can be a real frustration in a darkened room. The Bluetooth voice control works decently. Hopefully, you don’t get laryngitis. Largely ameliorating those complaints is a high-quality on-screen programming guide for those that like their OTA (over the air) TV, and a couple of new apps that feature 4K UHD content. After all, it’s nice to have something that shows the benefits of those additional pixels that are increasing your utility bill. Regardless, an on-screen interface and remote that match the quality of the picture and display should be number one on Sony’s priority list. All those shortcomings aside, the picture on this TV is so nice compared to the entry-level TVs we’ve been living with for the last year, that we’d forgive it just about anything. When processing and playing our UHD videos, there was virtually none of the judder that cheaper TVs suffer, and detailed panning shots showed only the most minor of shimmer defects. And that was when taking great pains to spot them. The X930D’s blacks are deep, contrast is very good, screen uniformity was near perfect, and it suffered only marginal blooming with bright objects on dark backgrounds. As I said above, it’s heads and tails above anything low-end, and it’s better than just about everything in its price range. Sony isn’t doing this with OLEDs, or quantum dots, or even LED array backlighting (although local dimming is supported). Instead, the company is taking its own path, generating light on the side of the panel with yellow phosphor on blue LEDs and distributing it via an array of mirrors behind the display. You’d really never know it—there was no side bleed at all. We measured 518 nits of brightness with a pure white image and the settings cranked. The system works. Earlier, we called the X930D’s picture subdued. We’ll stick with that, though what we’re actually talking about is a somewhat cool color temperature. That’s a hallmark of LED backlighting, but in this case it’s far less dramatic. Samsung SUHDs have a warmer look, and LG’s OLEDs are velvety, but the Sony delivers very nice color. The Sony X930D’s greens aren’t lime-tinted, as you’ll see on some cheaper TVs. The sound of the Sony X930D, on the other hand, is distinctly average. Speakers need a certain amount of air to do their thing, and thin TVs can’t provide it. We’ve heard much worse, but this is a TV best piped to outboard audio equipment if you want to watch anything other than news or soaps. Then again, living in an apartment, I found listening through the headphone jack was just fine. Dolby Digital, Dolby Digital Plus, and Dolby Pulse (AAC) are all supported. The Sony X930D delivers a picture that’s far beyond that offered by most TVs on the market, including last year’s Sony C series. Color, contrast, and HDR aren’t quite what you get with LG’s OLEDs or Samsung’s best quantum-dot SUHD sets, but they are close enough to be mentioned in the same sentence. And the X930D will get you out the door for a lot less coin.